Lunch at Sun Dong Nan set the tempo for the rest of our exploration of Koreatown. Across the street from our lunch spot is the landmark Chapman Market, a beautiful Spanish and Moorish style building dating to 1929. 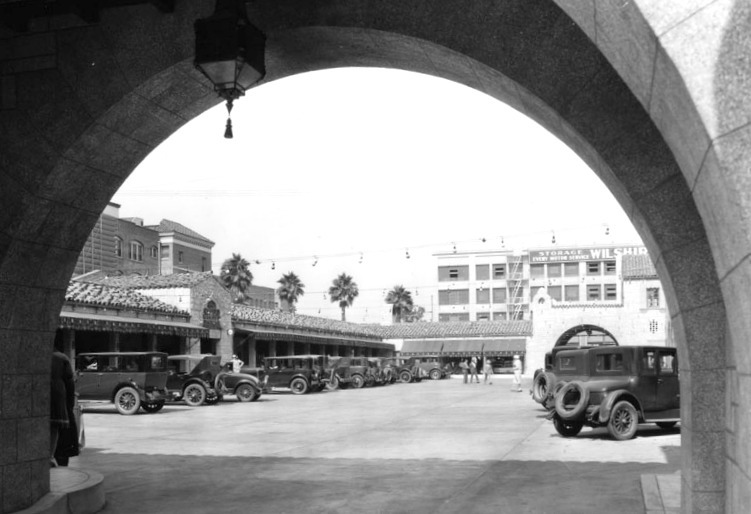 In its heyday, it was the city’s first drive in mall, frequented by wealthy families and Hollywood movie stars. Archway leading into the Chapman Market. 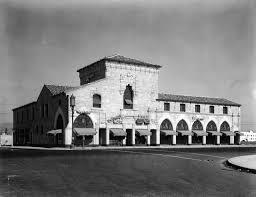 This luxury one stop shop for produce and dry goods was unique in that you could just drive through the archway into the middle patio, park, then shop. 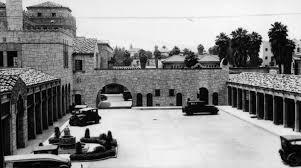 In 1988, it was named a Los Angeles Historic-Cultural Monument. After several new owners and renovations, it is now home to Korean boutiques, bars and restaurants. A visual beauty! Just down the street, we discover City Center, a three-story mall catering to the Korean population with a variety of shops including The Face Shop, where we purchase several face masks to please, please, diminish our wrinkles and a glance at sunglasses where the friendly salesman eagerly tries to sell us $450 glasses. All we want is a referral for something sweet to eat. He sends us to Okrumong, a few blocks away, his favorite place for shaved ice. Anything cool sounds heavenly. 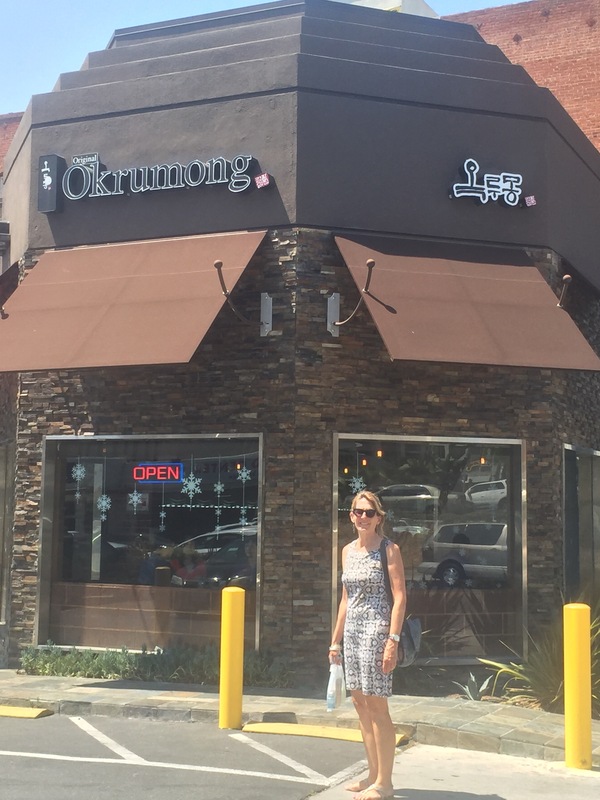 Okrumong reminds me of a tea room where friends would meet for an afternoon indulgence. Overwhelmed by the dessert choices, we decide on Green Tea Snow. 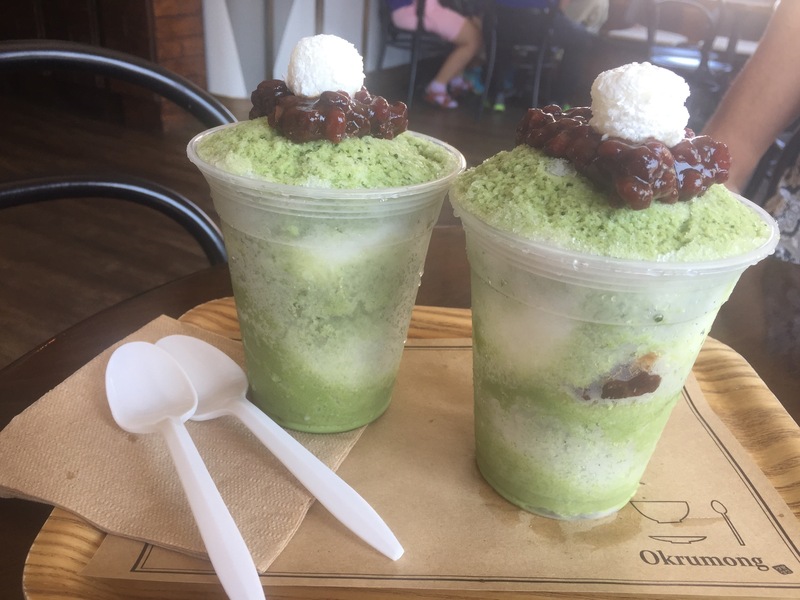 Green tea shaved “snow,” layered with red bean paste, and topped with something that looks like a marshmallow but is actually a squishy rice ball. 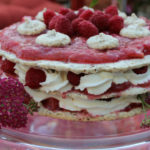 We both take a bite, expecting even a hint of sweetness but find only a tinge. “Refreshing,” is Eva’s description. Trying hard to get my taste buds to adjust and actually enjoy this speciality is difficult. I’m sure it’s an acquired taste, especially when your sweet tooth is used to more sugar. We both agree that we are happy we tried it but would probably not attempt to recreate it at home. On our way out of Koreatown Plaza, or KTP as it is affectionately known, we spot a store selling enormous, almost gaudy gold chairs. Of course, adventurous Eva must go in to inquire. We are greeted by a super nice salesman who offers to let us experience “The Bodyfriend,” an upscale massage chair. I watch as Eva sinks into the chair and then is almost wrapped in by the salesman. 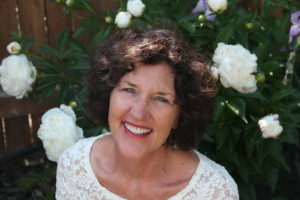 They turn on the magic and she drifts into bliss. “Do you want to try it too?” they ask me. Yes yes. This is just the thing I need! I tuck into the chair, close my eyes and the next 10 minutes might have been the best massage I’ve ever had. I feel like three people are massaging my feet, neck and arms simultaneously. This piece of luxury comes at a price – a cool $9000! Completely refreshed and rejuvenated after this session, we are ready for dinner. Eva chose a pub on Western Avenue but our plans were about to change. The valet hints that Beer Belly is the best joint in this area and we really ought to try it out. So we did. Beer Belly is a cozy beer bar tucked back off the street behind an ice cream shop. The vibe is low-key but not the beer or food. We eat on the vibrantly painted patio and are treated like queens. The craft beer choices are all from the Los Angeles region. 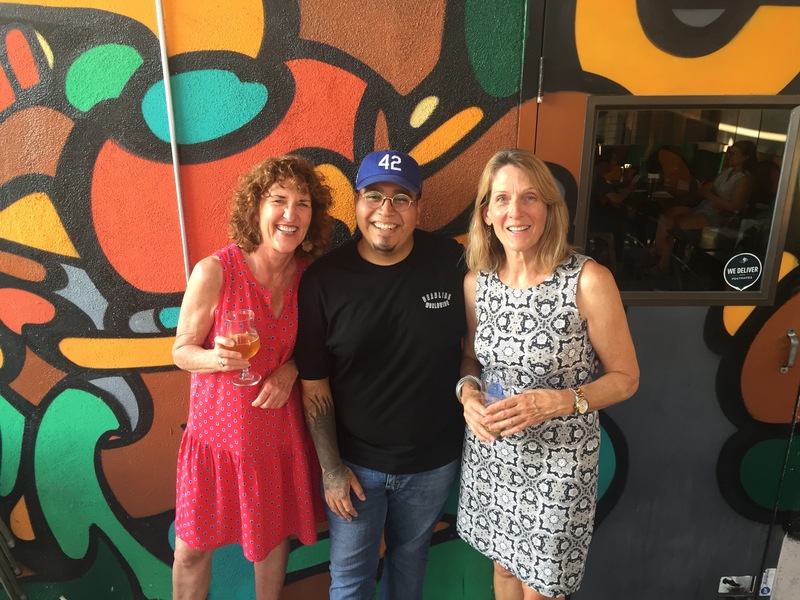 Beer Belly’s message is simple and beautiful: “To us, craft beer represents a conscious movement of good will.” From Gardena’s State Brewing Company, I choose an Oolong Summer, a Kölsch with oolong tea infusion. 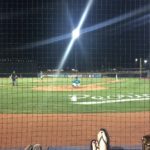 Not at all what I expect – better! It has a kick and is refreshing. The menu as well is carefully crafted. 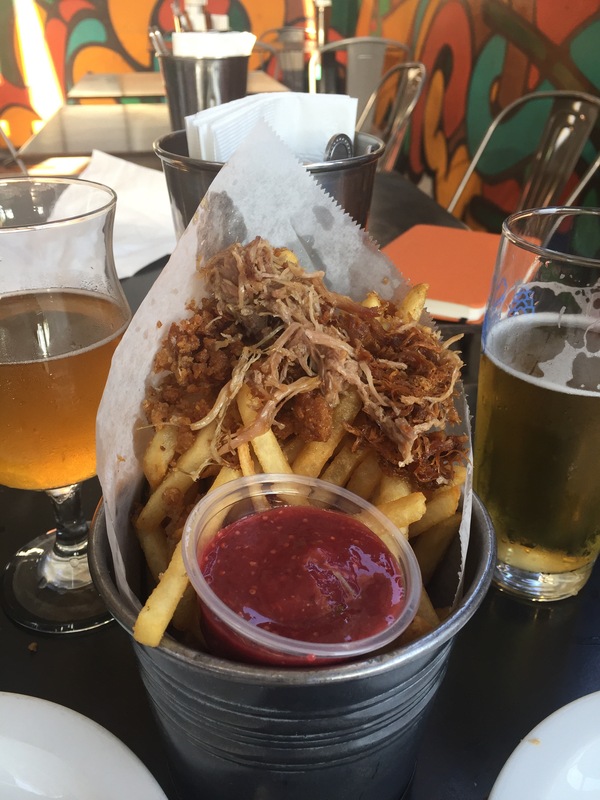 We split an order of duck fat fries topped with duck confit and served with homemade raspberry mustard sauce. Talk about creative. My salad reminds me of something I would get in France, but LA style. It’s the LA Wedge Salad. 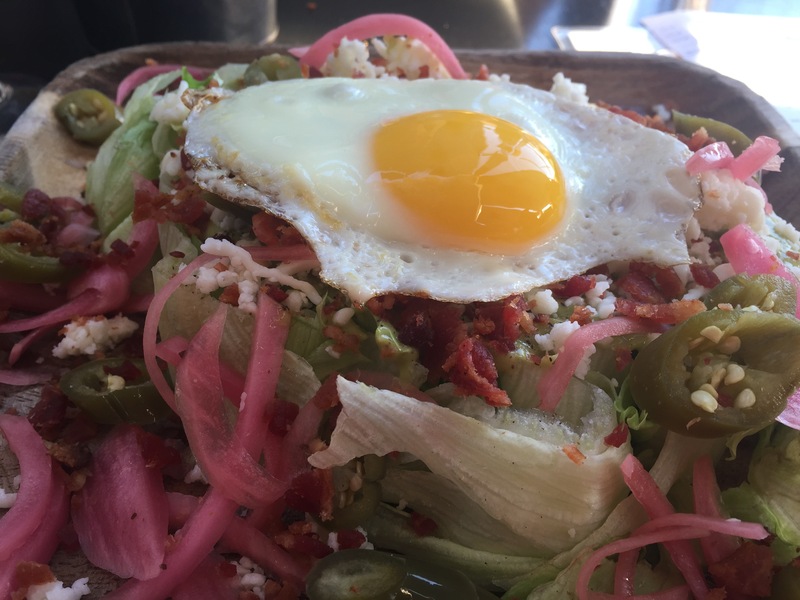 Iceberg lettuce, avocado, pickled hot peppers, pickled red onion, queso Oaxaca, applewood smoked bacon and a fried egg gracing the top. Salty, spicy, crunchy and cool. It is perfect and I know I am in LA. The food here is made with care and creativity and the staff is extraordinary. I just wish I could have tried more items off the menu, but the prior heavy lunch would not permit my stomach to expand any more. I will return for their sincere hospitality and dedication to making their place in Koreatown. Sitting on the patio, I have a view of a saying painted on a building wall across from us. 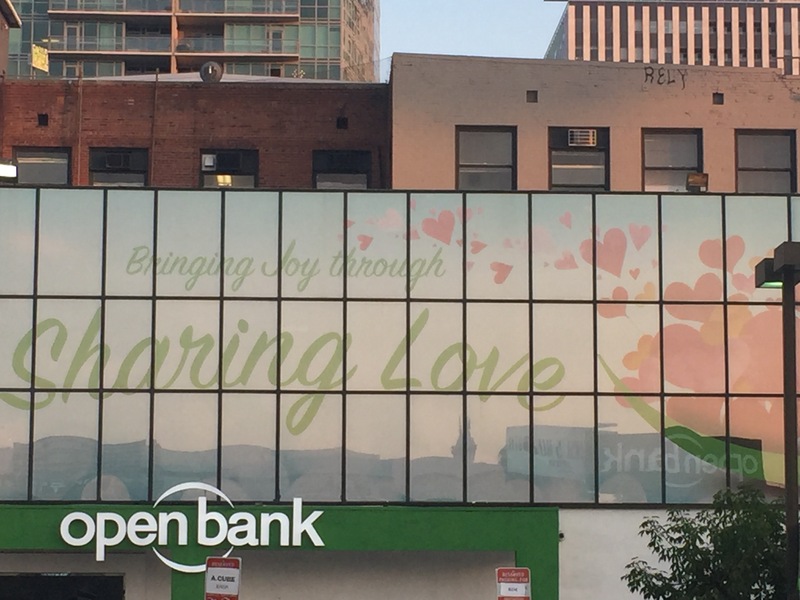 “Bringing Joy Through Sharing Love.” And this sums up my day of adventure and food in Koreatown. The people we met, all of them, are warm, friendly and engaging. I can’t wait to return!